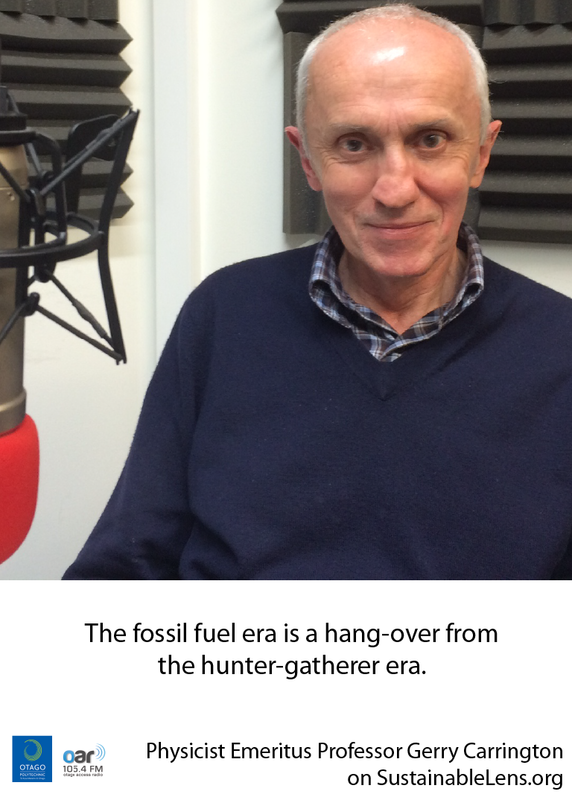 The fossil fuel era is a hang-over from the hunter-gatherer era. 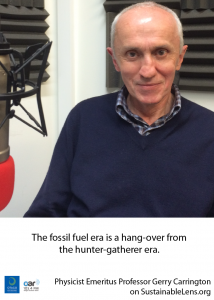 Finding fossil fuels is something that is a bit speculative – a form of hunting, and digging it up is a form of gathering. We’ve moved away from that, most of us, 10-12,000 years ago in relation to food, we just haven’t done it in relation to energy yet. Physicist Emeritus Professor Gerry Carrington was lead author on Royal Society of New Zealand’s recent paper on Facing the Future: Towards a Green Economy for New Zealand. Energy efficiency is an open ended opportunity – it’s something that we can continue to work on and transform the way society works if you take it seriously. Just seeing the beginning of the transition. Nobody knows how quickly it will occur or when it will reach full maturity. Some transitions in the past have taken place extraordinarily quickly, in the US when they transformed from being mostly run by horses to people having cars, the transition from 10% to 90% took place in 10-15 years. Managing what you’ve got really well. In the era we moved away from hunting the people that made arrows and spears found that business didn’t go so well, so yes there will be winners, and there will be losers and we have to find ways of dealing with that. Sam’s joined-up-thinking: Previously on Sustainable Lens, Dr Bran Knowles described how appealling to the selfish “do this because it will save you money” not only doesn’t work but does a disservice to sustainability. This week Energy Minister Simon Bridges blamed the failure of power switch policies to lower power prices upon individuals not acting in their own best interests – we need to be more selfish he says. This shows for me that while selfish behaviours might work at an individual level, they should not form the basis of public policy. Instead we need structural change, and as Bran said, appeals to wider, perhaps altruistic motivations. Shane’s number of the week: 38. That’s 38%, the predicted loss in food production for China with a 2 degree increase in global temperature (via Gwynne Dyer).